Jim Walden was another former Nebraska assistant who had accompanied Warren Powers to Pullman in ’77. After playing quarterback at Wyoming for coaching icon Bob Devaney, his claim to fame included being drafted by the original 1960 Denver Broncos although he chose to play in Canada before returning to the US to coach. He began as a high school coach until Devaney called him to join his Nebraska staff. When Powers bolted from Washington State for Missouri, Walden happily stepped into the head coaching position. Fans were glad to hear him address the revolving door of coaches who came and quickly departed from the WSU campus. “I’ll be at WSU long enough to see all my kids graduate from Pullman High School. The merry-go-round is over at Washington State. 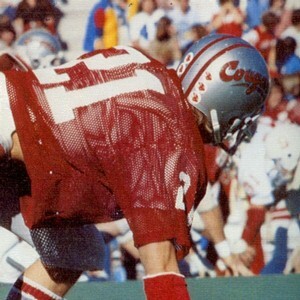 I’m goin’ to pull the plug on the machine.” Walden put his individual mark on the uniforms by removing the white center stripe and the Cougars entered the fray in 1978 with the silver shell they had worn since Sherrill had arrived, now adorned with one-half-inch crimson flanking stripes, and the distinctive crimson script “Cougars” decal that stood out as the letters were still outlined in black. He remained optimistic, even though his great QB Thompson needed surgery prior to the start of the season on his non-throwing shoulder. Going 3-0-1 buoyed him further but the team tanked and lost seven straight once they hit the teeth of the conference schedule. Thompson completed his collegiate career with numerous records including 7818 passing yards and was an All American. Still, the offense sputtered and was often as ineffective as the defense leading to the 3-7-1 mark. Tali Ena contributed 728 rush yards running behind All Conference center Mark Chandless while NG/DT George Yarno again led the defensive front. Yarno had a lengthy career with the Bucs as an offensive lineman, finally finishing with Atlanta and Houston. He later became an assistant coach at a number of college stops including WSU from 2003 through 2007. Born in American Samoa, Siaki “Jack” Thompson was a tried and true Washington Husky fan and certain that his career at Seattle’s Evergreen High School would lead to collegiate stardom in his hometown especially after UW head coach Jim Owens was to visit his home. Thompson was definitely a star by virtue of the 2905 passing yards amassed during his high school career and he was the team leader that pushed the squad to the state semifinals in the State’s first year of playing for a state championship. Owens’ visit was a very big deal in his neighborhood, and twice Thompson’s mother prepared food, his father twice altered his grave yard shift schedule at work to meet the famed coach, and twice they were stood up after UW head coach Jim Owens failed to keep the appointments. Thompson headed to Pullman but first suffered a knee injury prior to his first season, then found himself on the bench in a running offense. When Jackie Sherrill arrived in ’76 with a passing offense, it took another four games to earn a start but from that point on, the confidence that Thompson always had shined like a beacon. He completed 208 passes for 2762 yards, and twenty touchdowns, huge statistics for that era. By the end of the 1978 season he completed a great college career with the NCAA record of 7,818 passing yards, set the Pac 10 records for attempts, completions, and touchdown passes. He had won All America notice three times, shortly thereafter had his number 14 jersey retired by WSU, and went to the Cincinnati Bengals as a first round draft choice. His four years there were average and he completed his pro career with two seasons in Tampa Bay where in ’83, he showed some of the brilliance of his collegiate career. Active in both business and with his community, Thompson has worked with the Salvation Army and volunteered as a high school coach. His son played for WSU and his nephew for Stanford and Thompson remains one of the most popular and best known players in Washington State history.